You’ve been in therapy for months, but something doesn’t feel right. After much deliberation, you realize that the problem might be your therapist. Many people have chosen to end their relationship with their therapist and begin working with a different therapist for the sake of their treatment. But how do you know when it’s time to call it quits? 1) You’re not getting anywhere. Therapy is a process and you shouldn’t expect to see results right away. Therapeutic progress often starts small and grows slowly over time. It’s also true that therapy sometimes causes you to feel worse before you feel better because the process requires you to address the core issues behind a problem. 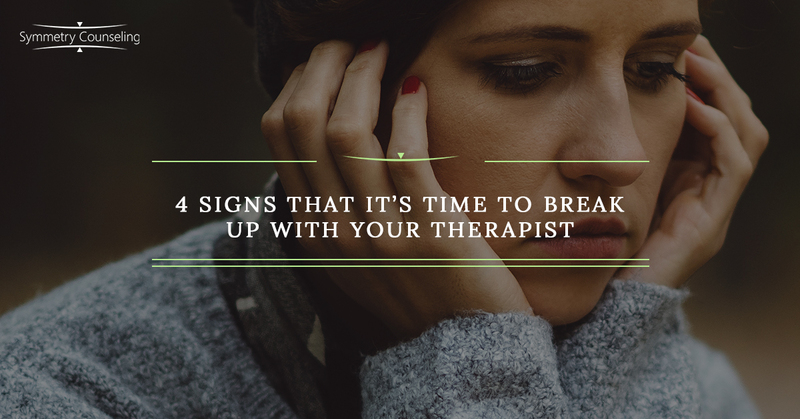 But if you’ve been participating in therapy consistently for a while—say, three to six months—and you haven’t noticed any changes, you should start a conversation with your therapist. It’s possible your therapist might be able to change your treatment plan to better meet your needs. If you do not feel encouraged by this discussion, or if your therapist is not willing to talk about it, then it might be time to seek therapy elsewhere. 2) You’ve made progress and it’s time to move on. Congratulations! You’ve come a long way and you’ve accomplished your goals. Now you’re starting to feel that there’s not much left to address with your therapist. In fact, sometimes you’re not sure what to discuss in therapy. That means it’s time to talk to your therapist about a plan to end therapy. The plan could consist of decreasing the frequency of sessions—perhaps to every other week or once a month—or scheduling sessions only as needed until you’re ready to end therapy altogether. Many therapists will extend an invitation to resume working with them in the future if needed. 3) You aren’t addressing your goals. You came to therapy with the intention of addressing specific goals such as learning to manage anger, coping with panic attacks, or improving communication with your spouse. You communicated your goals to your therapist, but after months of therapy, you don’t feel that they are being addressed. Remind your therapist about your goals and ask about your treatment plan. You might find that you are in fact addressing your goals by focusing on the core issues that are causing the problem—for example, if your goal is anger management, you might be working on decreasing depressive symptoms that are fueling your anger. If your therapist is unreceptive or unable to explain how your treatment plan is moving you toward your goals, it might be time to end the relationship. 4) It’s simply not a good fit. You are not going to match with every therapist, and that’s OK. In fact, it’s expected. Therapist-client mismatches can be caused by a number of factors, such as personality differences, cultural differences, and the therapist’s training. It’s important to experience a safe and healthy relationship with your therapist. If you discover that your therapist is not a good fit for you, simply inform them that you will be looking for a new therapist. If you decide to break up with your therapist, don’t lose hope. There are many different therapists, and it’s possible to find one who meets your needs and can help you to achieve your mental health goals. If you are considering beginning or resuming therapy with a new therapist, consider one of the many talented counselors at Symmetry Counseling. Call (312) 578-9990 or contact Symmetry Counseling to schedule an appointment.